The debate over the outlook for the Australian economy what it means for monetary policy has intensified in the wake of a weak run of data of late. However it will be the key data due between now and the RBA’s next meeting which will have the biggest influence over the outlook. A run of weak data over the last month has seen the outlook for monetary policy, according to market pricing, continue to turn. Three months ago, the market almost had a full rate hike priced in. 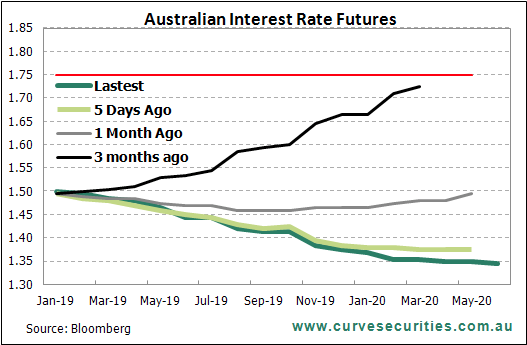 Three months later and the market now has the odds of a rate cut at a 2 in 3 chance. Over the same period, the RBA has continued to talk up a positive outlook for the economy. Based on their outlook, they still see a greater probability that the next move in the cash rate will actually be up, not down. There is no doubt that the data over the past month suggests that the risks to the economy are building and that the RBA’s positive outlook may need to be revised down. By how much so will be determined by the data that will be released between now and February’s meeting. So far, the weakness in the data has largely flowed from the housing market. The RBA has repeatedly acknowledged this weakness and is comfortable with it. Given how big the housing market boom was in the proceeding 5 years, there was always going to be a pullback at some point. The key to any shift in the RBA’s outlook will be if or when the housing market weakness feeds through to the broader economy. This week will see the latest employment data released. To date, there has been little sign that the weakness in the housing market has impacted overall employments. We will also get the latest retail sales numbers on the day of the RBA meeting. Retail sales have thus far held up well. We know that the RBA will need to downgrade the near term growth forecasts due to the weak print in Q3. How much more they will need to adjust their outlook will become clearer between now and their next meeting.